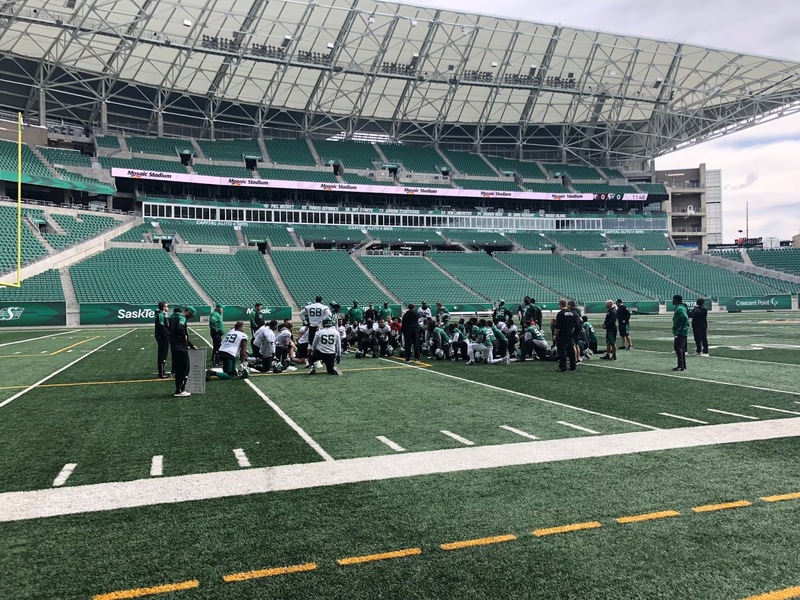 REGINA - The Saskatchewan Roughriders will experience Manziel Mania for the first time this weekend. The Roughriders (8-5) visit Johnny Manziel and his 3-10 Montreal Alouettes Sunday morning at 11:00 AM Sask Time at Percival Molson Stadium on TSN and the 620 CKRM Rider Radio Network. Riders Head Coach & GM Chris Jones is eager to face the man known as "Johnny Football". "Well I mean he's certainly a guy that can extend plays and he's very competitive," Jones said after Thursday's closed practice. "He's steadily improved, I feel like, throughout the course of the year. It was unfortunate for him earlier in the year that he got hurt, but he brings a lot to their football team." Despite the fact Manziel has yet to lead the Alouettes to victory since being acquired from Hamilton, Jones is wary of his abilities. "We've got our work cut out for us," Jones continued. "He's played in a lot of big football games down in the SEC and he's seen some very good defensive lines before. He's played in the NFL. We've gotta go over there with a workman-like mentality, give him some different looks and do a great job of keeping him contained." The Alouettes upset the Roughriders 23-17 back in Week 3 in Regina, although veteran Rider pivot Zach Collaros didn't play in that game. On Thursday, Collaros said Montreal is a different team two months later. "They're a defense that's gotten better as the season has gone along," Collaros observed. "They have a very good front four, John Bowman has been an unbelievable player in this league for a long time. Muamba's near the top of the league in tackles at the linebacker spot. Ackie does a great job too at WILL. In the secondary they've got a lot of experienced guys. They play their system well so it's going to be a challenge for us." A lot has been made of the time zone difference for the Roughriders, as the game will kick off at 11:00 AM Sask Time however Chris Jones says that may be over-played. "For us, physiologically, we actually will be starting exactly at the same time we begin practice," Jones explained. "We're gonna skip our Friday morning meetings and fly out there early. That puts us there 47 hours prior to the game."